We're big fans of monthly comics at the PCG, but if you missed an issue, or just fancy reading a story in a single sitting, a trade paperback or hardcover is the way to go. 1. It's so much more than a tribute to comics history. One of the most notable things about the world of Black Hammer is that Jeff Lemire has used the history of comics as one of the narrative threads of the book. As in the real world, the heroes of Black Hammer have gone through Golden, Silver and Bronze ages, and have a Legion of Superheroes-esque future ahead of them. In Age Of Doom, Lemire uses the 'dark' comics trend typified by Vertigo in the '80s and '90s. In her quest to find out the truth behind her father's disappearance, Lucy Weber travels to dimensions that will be familiar to readers of Hellblazer and Sandman. What works so well is that Lemire doesn't use the history of comics as a punchline, rather it's a salute, and a deftly-woven use of familiar tropes to move the narrative forward. As Lucy travels through the netherworlds, it's balanced by the heart-breaking stories of love and loss for Gail, Barbalien and Abraham Slam. 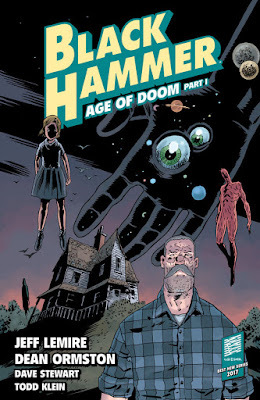 Black Hammer is a story about outsiders: despite their heroic mantles, many of the main characters simply don't fit in, and their attempts to overcome loss or make peace with themselves grounds the story, making even the most alien of protagonists recognisably human. 2. It's a tour-de-force from Dean Ormston. Black Hammer was first announced in 2014 but was then delayed due to artist Dean Ormston suffering from a shocking cerebral haemorrhage. Thankfully, Ormston recovered: not only is it amazing to see him back at work but his illustration of this title is nothing short of magnificent. He brings the different worlds of Black Hammer to life with aplomb, from the bucolic world of the farm, to the sci-fi strangeness of the Para-Zone. Every issue features at least one stunning visual moment, and a collection like this emphasizes how Ormston's work is outstanding. 3. It's got one of the best plot twists of recent years. I don't know about you, but I love a good plot twist: the moment everything you assumed about a story or a character is suddenly upended and you're forced to re-evaluate it all is one of the great narrative devices in any medium, and Black Hammer contains an absolute gem. Remembering the early noughties, and the trend for 'decompressed storylines' wherein it could literally take two years for a plot to resolve itself, Black Hammer feels like the total antidote to that. I love how Lemire paces his stories, and in the five issues collected here he pays off one mystery but then provides us with a perilous dilemma; it's brilliant storytelling, and provides a terrific hook for even the casual reader. 4. It's a title that's expanding with every arc. Jeff Lemire first conceived of Black Hammer back in 2007 and it's clear that this is a story that has fermented to perfection. Last year, Legendary Entertainment announced that they will be producing a 'cross-platform' series based on the world of Black Hammer - this is a franchise that's only going to continue to grow and expand. Despite the four spin-offs thus far, there's the real sense that Black Hammer has only just got started, and there's so much more to come. With this and the two previous collected editions, you can get caught up and get on board with one of the best ongoing series being published today. The Eisner award it received was no accident - Black Hammer really does strike all the right notes.